Being an astrologer, most frequently, I come across shouting and quarreling couples. They are not happy in their married life. In almost every case, the person who is seeking astrological guidance; is the one who finds faults with the life-style, habits, attitude etc. of his/her spouse. Though the joint family system is on diminishing count, many times the in-laws are also instrumental in creating disharmony. In Indian scenario, when such persons approach astrologer, they have big bothering Question mark: “Why to Me?”, “Why is she/he so blunt?”, “Why this is with us? – Our horoscope were got matched”. There issues with youngsters e.g. they have been in relaitonship and now the other person is turning face.. whether they will ever be able to get married, whether they will have happy married life if they get married etc. To analyze such situations, we need to understand the causes that bind persons into relationship or a wedlock. It is very important that we, at the very outset, understand the reason, why out of million others, none other but a particular person becomes our spouse? The cause is Karmic. During our life, as we deal with others, we create Karma. This means that either we owe something to others or we have some outstanding dues to be collected from others. This give & take is called Karmic Rinanubandha. This can be the joy as an output of positive karma or it can be sorrows and pain as an output of bad karma. This cycle of generating karma goes on continually throughout a life period. Many of such karma have very long gestation period. Such karma get accumulated and they are called ‘Sanchita Karma’. Thus, at any given point of time, we have collection of such Sanchita karma involving people with whom we have interacted profusely. It can be in terms of volume or it can be in terms of gravity of the transactions. The pull of the unsettled karma generates a bond between the persons concerned. These are the people who get attracted towards each other and establish relationship even in another life period. They become parent-child, husband-wife, brother-sister, in-laws, neighbours, co-workers, business partners depending upon the volume of karma to be settled. Thus, all our relationships are karmic bonds and the only way to overcome this, is to deal with them in a gentle manner. Now you know, why we marry with a particular person? It is only because of the pressure of unsettled karma. This way, every relationship is an opportunity to workout the Karmic dues. Your horoscope is a balance-sheet of your Sanchit Karma. Joys and Sorrows, both are reflected in your individual horoscope. Thus, whatever you have got is attributable to your own past Karma. No one should have any reason to pass on the buck to the other person. The harmony and joy or the quarrels and disgusts; are output of your own past karma. You have the possibilities charted in your horoscope as to the quality of your married life. As regards potential of marital bliss, you have your own balance to your credit. This potential would remain same whether you marry to ‘X’ or ‘Y’. This is the reason, I personally don’t see much of logic in Horoscope matching. However, if you understand the characteristics of your spouse as expounded in his/her Ashta-koota as a part of kundli matching, and adjust accordingly, you will have smooth life. Let our approach to relationship be positive. The bonds are result of past but our reactions should come from our Free-will. On karmic plane let us keep vigil. Let the dues of the past get consumed without anger and harsh reactions. This is the way, one can save oneself from generating further bad karmas. Always emember, you have come together to settle the dues and learn lessons together. 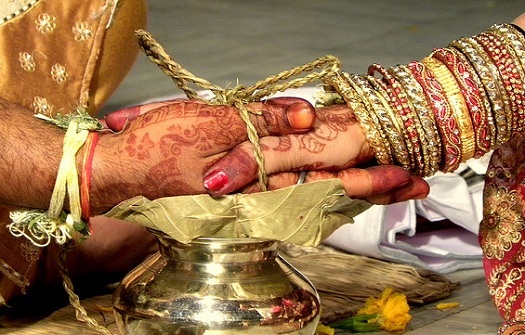 For the people who are in relationship for a considerable period and now the other person is showing indifference and lingering the decision to get marry; or people who were proposed and now astrologers have declared as incompitable combination, it should not be difficult to understand that if you two are sharing only limited amount of karmic dues, you have to get ready to give it up. If you have yet to settle the dues, no matter what, you will get marry. Unless you settle the dues, the relationship cannot end. I am married from 7 yrs having no. issue in another word childless . i am not able to reach the expectations of my in laws that is why i am disrespected from them . they neglect me n my husband on various situations. my husband dob 22/04/1973 time : 03:34 am jalandhar where as my dob 26/10/1976 time 15:25 pm chandigarh. when we shall have our own child. when we get happiness. Hi Oormi, it is very unfortunate that both of you have got married, I have interest in astrology, and hence writing this. Please immediately go to a very good astrologer as well as numerologist and seek for a solution. As far as I know, both of you have increased your bad luck tremendously after getting married. And, it is most likely to continue. You should get back to a very good astrologer and also a numerologist to reduce your sufferings. Wish you all the best…..!!!! I use a different form of astrology than most. Your birthday is known to have bad luck with relationships in general. Your love is meant for others, not for yourself. Your happiness will come more from giving others. I too cannot understand why you and your husband got married. I don’t see much compatibility here. There could be happiness for both of you, in the future. But as Raj said, I don’t think this marriage is that good. We can’t always place blame on the other person. We have to look within ourselves first. We have to work on fixing ourselves before we can consider fixing our partner. Often working on yourself gives repair to the relationship too. Thank you. It is quiet revealing and relieveing. It is always better to compromise and work out a win win situation. if the alliance is out of karma, one would end up in bad or good alliance with or without horoscope matching. Then better to accept each other and learn lessons as the article suggests. Oormi’s problem is then a matter of karma and even if they had shown horoscopes before marriage, the fate would have been the same. If a wife and husband goes for divorce that means their sanchit karmas are settled between them ??? Bhavani, Both yours and your husbands chart has Rahu positioned in the Fifth house and in yours jupiter and ketu are placed together. Both charts indicate Sarpa dosham. A place where many childless couples have become parents is Bhagawan Subramanyam swamy’s temple at AV.Mallavaram near Kathipudi, east godavari.dt. Try to visit mallavaram for 3 times in 2 months. And both of you take mantra of Subramanyam swamy and chant daily for 1000 times and you will soon become parents. my dob is 5/5/1953 and my wife’s 21/5/1958. as per our horescopes our rasis makara and miduna are in sastanga adn astanga position and we are always quarelling on some matter for the last 30 years.is there any solution? Facing lots of problems since birth like illness, highli qualified but no good job, problems with husbond family, deadly disease to husband and now taking care of child all alone. Is there any good time in life? I don’t know how I got an email with this link my in inbox and reading just the subject line instantly made me click on it. I was married for 2 years with my adorable husband but recently ona very very unfortunate day of my life I lost him in an cardiac arrest. I totally agree “now” that he taught me various lessons in this very small span of time. Though I remained in constantly bad relationship with my in-laws, they never loved or respected me but my husband was a very nice human being and he made me survive smoothly with all the adverse situations created by my in-laws. I still could not understand why I lost him. My DOB is 7-May-1984 , 6:55 AM Indore and his was 21-July-1980, time unknown (morning) Itarsi. Can please somebody tell me about, why it happened to us. Please help me, i constantly feel guilty of the doubt that if my bad karmas snatched his life. I lost all the hope of marriage I loved a girl who betrayed me when she got a rich guy. I feel because of her I was suffered so many years my whole life is becoming very bad I am thinking I don’t want anything. I wanted to married with any girl I am a brahmin but I wanted any girl any religion previously I was thinking in my caste only I am too old I feel. I am born on 17/05/87 and my husband is born on 3/06/82. both of us argues on small things we try not to make it a quarrel and we do successed but why we fight so much …and both of us says that my point is right …. can u please tell me who is right ? and uptill when we will fight ? Also consider this : The universal system always work on optimizing principles. If both of you are at the climax of what best can be created genetically as well as intellectually; you may end up childless. It is like reaching to the highest possible combination. So be happy. If you look at any branch of a plant; you will see that at a certain point, there would not be any further branches..
Hope you follow what I mean. A small correction. God is so kind. He keeps on allowing us to correct the mistakes by way of new life. If you are interested to know the secrets of past lives; I would recommend you to read books by Brain Weiss. Start with his book ‘Many Lives; Many Masters’. Hey. The sanchita Karma will provide you with circumstances, environment and related people with whom you share karmic dues. However, while dealing with the circumstances and the people; you always have your free-will. On the basis of your reaction; the karmic dues either gets settled or you end up with creating a loop of further karmas. As we don’t know whether a particular person behaves with us is due to karmic dues; the Mistake on Safer Side’ would be to behave in a sound manner, with ‘Let Go’ attitude. This is the key to dissolve bad karmas. Yes’ if you do not create a scene. If you do not create bitterness. If you do not act with vengeance. No’ if you react with bad temperament; vengeance and bitterness. This will definitely create new karmas. If you have taken out positive inferences and learnt lessons, you will not be put to same challenging circumstances again. Once, the parihar is performed; will Rahu and Ketu and other planets responsible for being child-less; shift to favourable houses in the horoscope ? If horoscope alone decides the state of happiness etc. of married life; the same results should be indicated. Say, if a person has bad planetary combinations for houses and planets significating married life (e.g. 7th, 11th, 2nd and 5th houses and Venus being significator of Love) it would be so even if the person gets married with X, Y or Z person because the Horoscope remains static. Horoscope does not get modified or updated after marriage on the basis of planets of the spouse. The Karmic dues decides with whom you get married and how long you live together. Matching, with its wide spread acceptance; can certainly be instrumental in pushing a person to the one with whom one has to settle Karmic Dues and learn lessons. The crux of the matter is; to develop Let Go attitude so that we don’t end up creating further unfavourable Karmas. Thank for very good Article. we are married for past 3 years and still childless, can u plz let me know what needs to be done in order for us to be blessed with a child. my Dod-04-04-80(hyderabad) my wife dob-23-09-1981. Hi, my marriage is getting delayed for unexplained reasons. Every time we approach an astrologer, he says, we will get married in 3-4 months, but nothing has happened in past 2 years.